Out of those, I hate cutting the most. In fact, when I’m not sewing it’s often because I can’t face up to the idea of cutting something out! I use a rotary cutter, which is easier than anything else of course, but even so I hate all the pinning and marking. Patterns are tedious too, but not as bad as fabric. 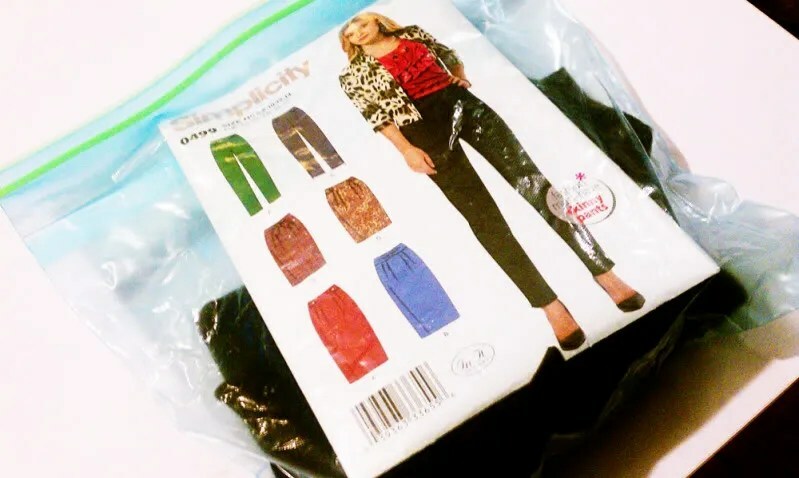 I’ve been trying to figure out what to do about this issue – I hate to miss out on sewing time because the part I don’t like comes first! 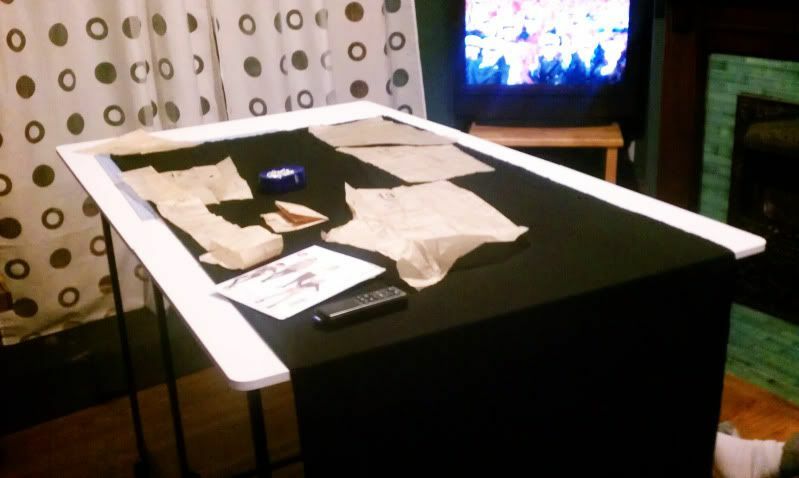 I brought my cutting table into my living room, put on some tv I’d been meaning to watch (Stephen Fry’s “In America” on Netflix) and set myself to cutting. Cutting is much more fun with something to watch! I’m also trying to train myself to use pattern weights for smaller pieces, to avoid pins. I don’t have a cutting mat that is as large as my table, so that only works with small pieces, as I need to scoot the mat sometimes. I’m way to cheap to pay as much as the large ones cost so far, but eventually I may get one! After I cut the pieces to a pattern, I marked them (with my chalk pen) and removed the pattern pieces. I put them in zip loc bags with the pattern. This way, when I want to sew I can just pull a the pieces out. 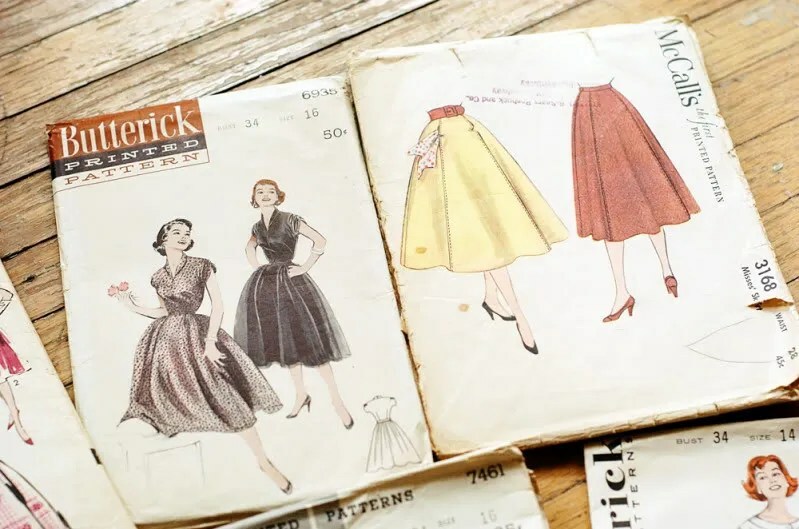 I’m still working on cutting my winter wardrobe today, and then I have a rehearsal tonight, but tomorrow I plan to start some sewing! Ok, so I won’t be winning any bodybuilding competitions, but if you look really closely you can see actual muscles! 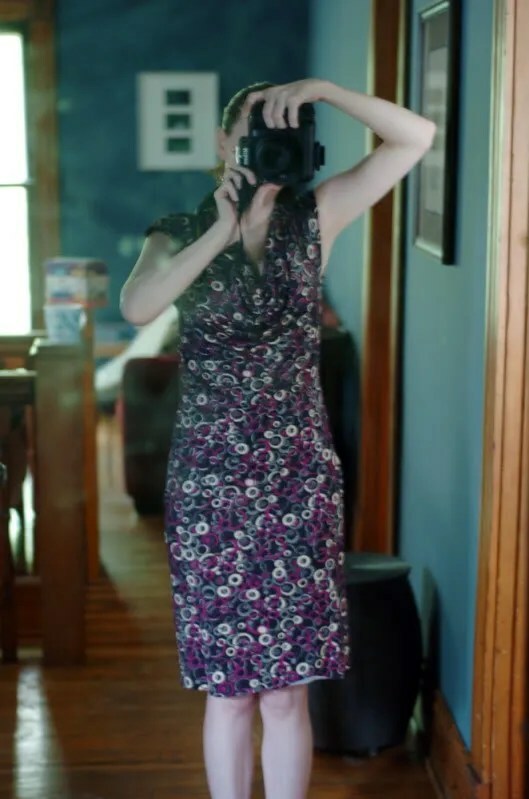 I don’t have a body type that builds easily on my upper half, as it is naturally small, so this is exciting. The plan has a ton of plank and pushup work for upper body. At first this made my wrists ache, as I have tendinitis, but after awhile I actually felt my wrists strengthening. It has actually aided in my playing – I used to get aches in my wrist after a long session, but not anymore! I also made a full body collage of the changes I’ve seen. Having a visual record of progress makes it easier to continue on days that I’d rather just nap! The biggest change is core strength, as I think you can see in the top row. You should be able to click and make the photo bigger, I know it’s small. I’m not dieting (or changing my diet really) so any change is due to the plan. I actually know singers who refuse to do core strengthening exercises, as they believe it will form a ring of muscle that will impede their breathing and lung capacity. I don’t find this to be the case, though I suppose it’s possible that overtraining might cause a problem, especially if you overtrain only one part of the core, if (for example) you only did traditional crunches. My knees have strengthened as well. I used to get pain in my right knee sometimes, but as I’ve strengthened the muscles around the knee that has gone away. The biggest change, though, is in how I feel. I have more energy overall, and my self-esteem has increased. I think my body is healthier – I got my usual November/change of the weather cold this week, and it was gone in 6 days (plus I never got as run down as I usually do.) I exercise for an hour on average, 6 days a week (it’s actually longer than an hour on strength days, and less on cardio (I do 40 minutes, as I’m still working on endurance.) I am telling you, if I can do this anyone can. I have not seriously committed to a plan like this in my entire life! I used to dance, but that was different – and I was not a super great dancer either! I did exercise when I was dating a trainer, but it wasn’t for me, and I didn’t see great results. I plan to continue with the plan, and after that is over try a different plan. I’m trying to make this a lifestyle change! I’ve bought way too many exercises dvds, and my husband is getting me an x-box Kinect for Christmas. I tried out one of the dancing games, and it’s a great workout – I love to dance, even if I’m not the best! 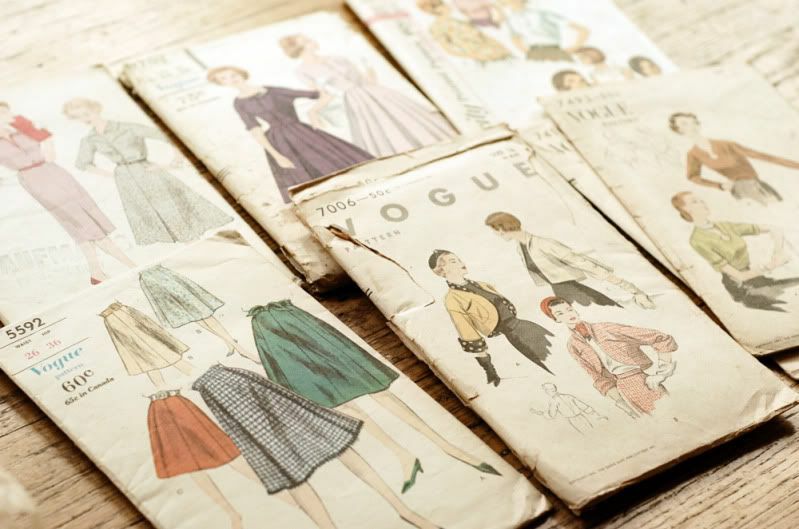 I hope to be back later this week with some completed garments – hopefully even some pants! 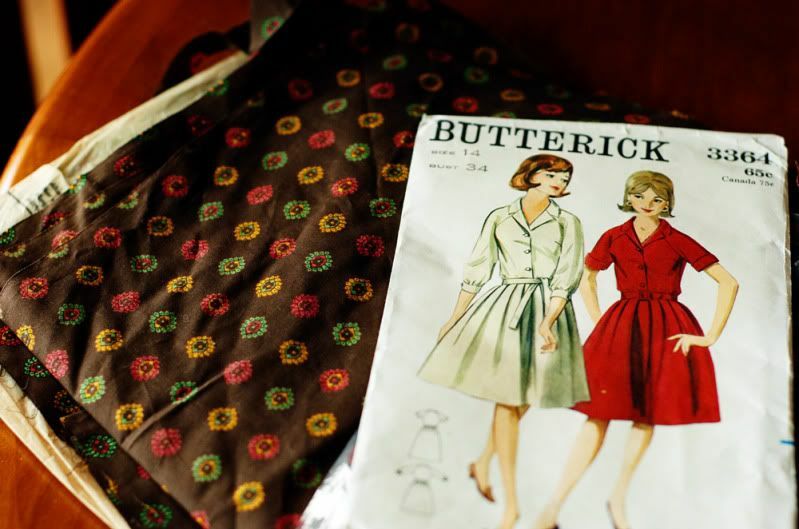 I finally managed to find the Fall Butterick patterns on sale – I’ve missed the last few, but they were at Joann’s last week. 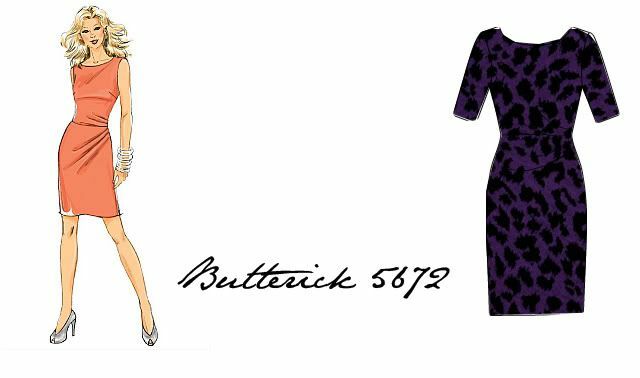 My favorite is this dress, which I’m making from the purple leopard ponte knit I found at fabric.com. The actual scale of the print is smaller, but I didn’t feel like taking another photo to get it to work. I really like the pleating on one side – let’s hope it looks good in real life! I’m not using a lining (suprised? I didn’t think so.) I am making the version with sleeves, because I don’t have many dresses that have them. I hope to get to work on this cut tonight, and maybe sewn on Friday and Saturday. I seem to not have weekends lately, due to performances and socializing, and that’s when I usually do my sewing! I’m also pretty uninspired in these in between seasons – I don’t want to think about the cold yet! I’m still on my exercise plan – I know, I can’t believe I’m sticking with it either! Right now I’m doing the Ballet Body Periodization plan. 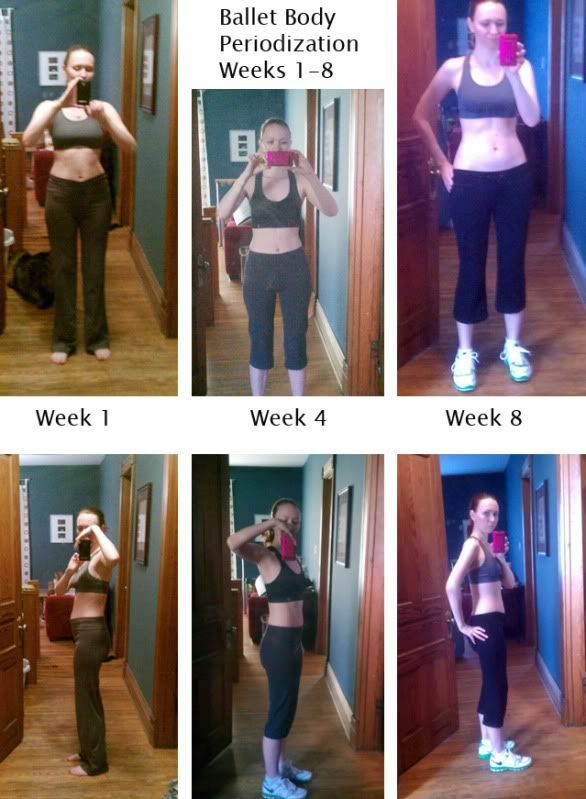 It’s a series of internet downloads that you string together into long workouts. They build on each other, and you get to do your own choice of cardio every other day. 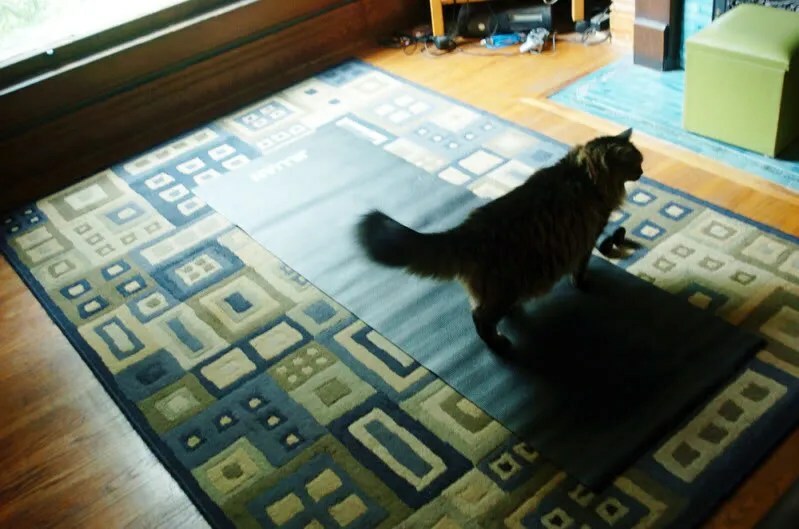 I really love the workouts – it’s kind of a combo of Lotte Berk/Callinetics style barre with some yoga and pilates. There are a lot of body weight resistance exercises (planks, pushups etc.) 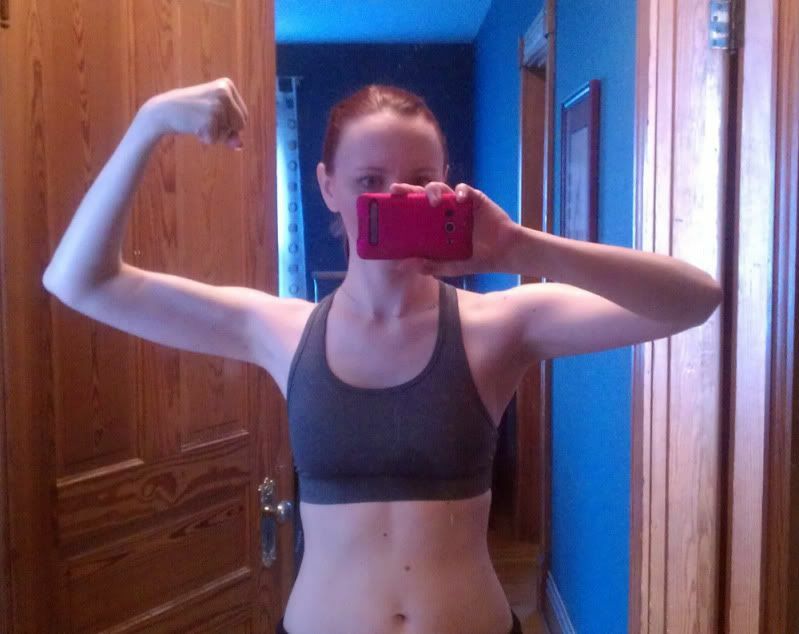 I’m getting some real strength gains, which is pretty exciting to me! I never thought I could enjoy pushups after my high school gym trauma, but here I am, doing them a few times a week! I’ve been doing dance and step aerobics a lot for cardio, which is required 2-3 days a week on the plan. I didn’t think I would like step, after having done it in the 90s, but I found some fun videos, and even bought a full sized step (my old one is smaller than the ones in the gym.) I keep the height low (4 inches) and have no knee problems from it. I actually think the combo with barre is making my knees stronger. Christy Taylor: Mission Possible is what I started with. It’s half dance aerobics and half step. The music is super fun, and it’s not hard to catch on (keep in mind I have a dance background, so… YMMV, but this is the one that was recommended to me as her easiest.) I also have Fit to Dance, which has step and weights, which includes a techno version of Dance of the Sugarplum fairy from the Nutcracker. I do love weird techno mixes. For dance I also recommend Petra Kolber. I have Bootcamp Boogie and 123 Dance, and they are both fun. Kind of medium level choreography I think. Bootcamp Boogie is the easier of the two. The music is ok – better than many, not as good as the Christi Taylor dvds! I have some others (I put out a call to my friends for dvds, and you wouldn’t believe how many people want rid of exercise dvds… less guilt that way! I’ve also been hitting garage sales on weekends.) I have two of those infomercial sets – Turbo Fire and Rockin Body. Rockin Body is mostly hiphop type dance, and it’s fun and easy – too easy for me I suspect, as I actually like choreography. I haven’t tried Turbo Fire, which is a sort of kickboxing with pretty good music. It’s very fast, and I haven’t done kickboxing since the 90s – might have to brush up with one of my ancient Tae Bo tapes! I’ll try to be better about updating! It may be more dithering, since I haven’t had time to sew, but I do find that I miss the blog when I haven’t written in a week or two. After a little distance I feel a bit better – I think if I take in the sides above the waist by a few inches I will be happy. The reason it looks off is that it’s simply too big up there! I also plan to shorten it by an inch and hem (it isn’t hemmed above.) And then maybe wear it with a belt? But maybe I’m kidding myself… do you think I should finish it, or accept that it isn’t meant for my body shape? I love the sundress on the left. The other pattern? That’s a housecoat – how fancy! A lovely dress with gathered cap sleeves, and a skirt with inseam decorative pockets. 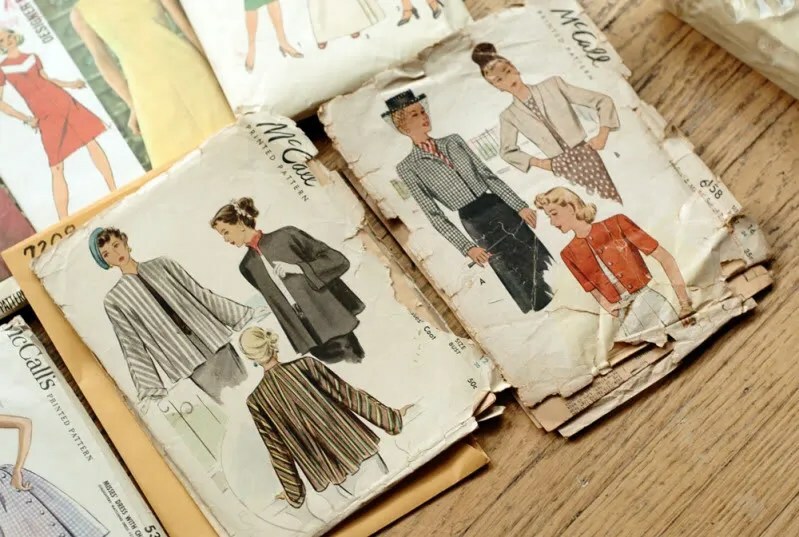 Two nice jackets from the 1940s. 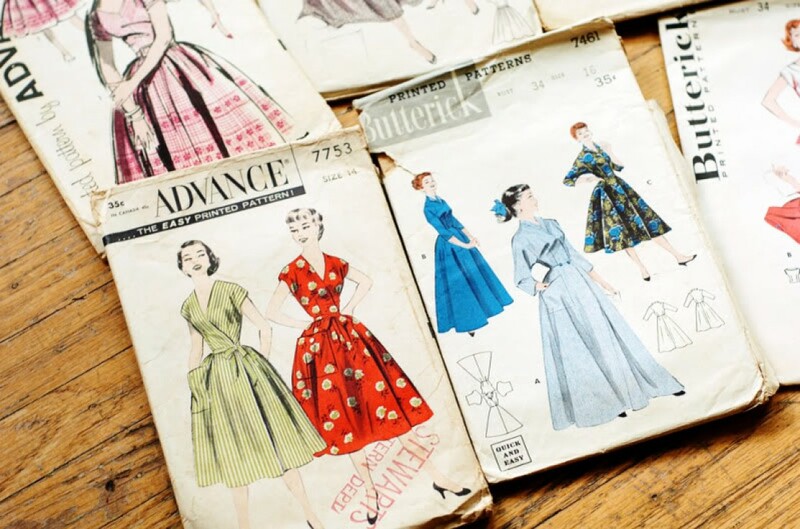 The seamstress really loved her patterns – when the envelopes fell apart she carefully made new ones! 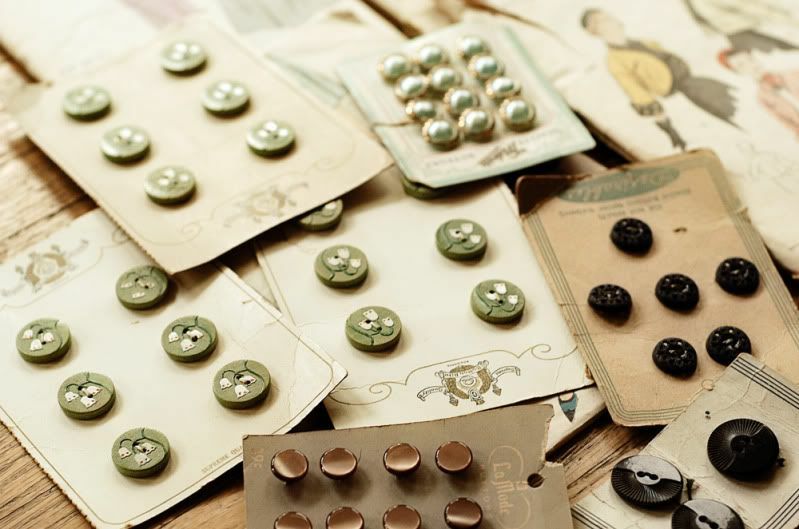 Carded buttons. The green buttons have little handpainted tulips on them. A pattern already cut out in a rayon print. I may or may not make it up, as right now it smells of mothballs. I’m airing it out, so we will see. 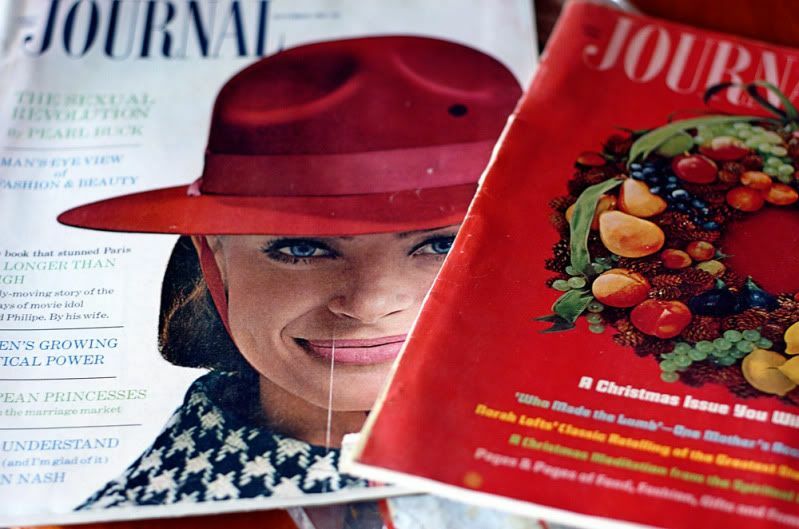 A complete set of Ladies Home Journal from the 1960s. I plan to resell these. I bought all of the above for $20 – a great deal! Then on Sunday, Marc was browsing random Craigslist ads and found a Fluidity Bar for $25, including the dvds! It’s basically a portable ballet barre – great for the ballet workouts I’ve been loving! It’s very sturdy, and much nicer to use than a chair. I saw the infomercial for this, but it was quite expensive, especially after shipping. I figured that eventually one would turn up on Craigslist! 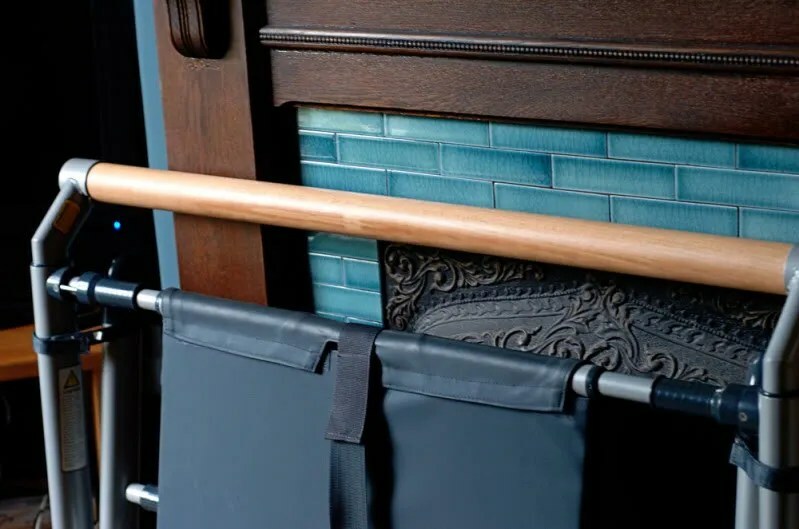 I plan to store it against the wall behind the sofa table, which isn’t pretty exactly, but it is easier than trying to lug the entire 55 pound thing from under the bed a few times a week! So, it was a great shopping weekend, abut a less great sewing one. I’m looking forward to starting my fall sewing soon, if not necessarily to the cold weather!